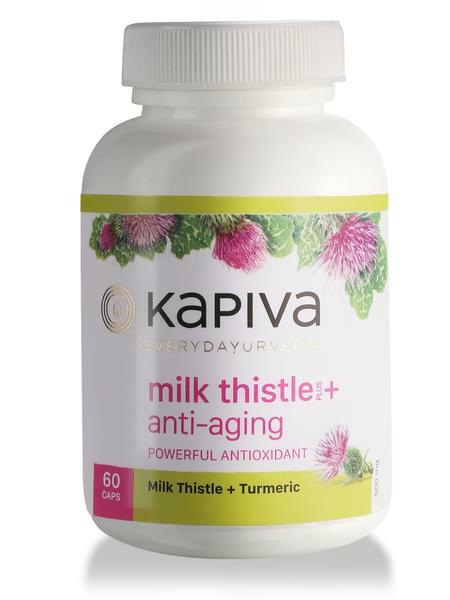 Kapiva’s Milk Thistle and Turmeric Capsule offers tremendous results to your skin and helps you in keeping your skin young and supple. Milk Thistle is an efficient anti-oxidant and therefore is a perfect component to enhance the health of your skin. On the other side, turmeric protects your skin from many infections elements and gives you smooth and shiny skin. Made from the combination of milk thistle and turmeric, this capsule will work as an antioxidant and provides numerous benefits to keep your skin healthy. Benefits of milk thistle: • Protects against skin diseases that cause dry skin, red spots, or skin allergies. • Milk thistle increases the bile production, hence offers great protection against acne and other skin allergies. • It’s an anti-inflammatory and antioxidant agent. Benefits of turmeric: • Protects against acne, pimples, and other skin infections and cures other skin scars. • Cleans your face from roots and protects from allergic agents. • Helps in wounds healing process by decreasing inflammation and oxidation, and gives natural skin.